Great news! We have received two grants, a $1500 grant from the Gere Foundation, which has been matched, and will be earmarked to purchase stoves to heat the nuns' room this winter. And an extremely generous additional grant from the Pema Chodron Foundation of $25,000, that will go a long way toward helping us install a kitchen and sanitary facilities in the new building. The Pema Chodron Foundation was also a major supporter of the earlier phases of this project. Please consider joining these extraordinarily generous donors and helping with any amount you can. In early October, a group of employees from SalesForce, a worldwide software development company, trekked to the Himalaya to spend their VTO (volunteer time off). SalesForce employees receive 6 days of paid VTO each year. A team of 14 volunteers from all over the world decided to give their time to the Mount Everest Foundation for Sustainable Development (MEFSD). Their service included trekking to Deboche to complete essential work on the exterior of the new residence before winter, and to work on the interior so that the nuns will have a more comfortable place to live. In addition to working at Deboche the SalesForce VTO team delivered laptops to several schools in the area. The trek was organized by SummitClimb.org, an integral part of the Deboche Project. Summit Climb has already heard back from the team about its interest in continuing to support MEFSD. Thank you SalesForce VTO and Summit Climb! April, 2018—Look How Far We’ve Come! These recent images show the incredible progress we have made on the new residence and meditation building for the Deboche nuns! Looks great, doesn't it? We still have a ways to go, though. We need heat, sanitary facilities, showers, all kinds of furnishings and a kitchen. Please consider making a donation to help us finish this wonderful building! The exterior of the new residence and meditation hall as it looked in April. Anis at Deboche for 16 day meditation and puja. In every building project there is a moment when it begins to look like the finish is within reach. For us that moment came when the windows arrived...but what a time we had getting them to Deboche! Because of their size and weight, transport by plane, the usual mode, was out of the question, because the airlines charge by the kilo. instead, we used helicopters, which meant that the materials had to be divided into smaller loads, each transported by different pilots who ended up going to different places! Locating the windows at the various drop-offs and hiring porters to carry them to Deboche was a gargantuan task that kept Mingma Tenzin Sherpa trekking back and forth for days on end. All we could do from this side of the globe was wait and pray. As he has with so many other phases of the project, Mingma managed to coordinate everything beautifully and take these latest pictures, so we can share with you this incredible moment... the new residence is now secured against the elements! So much remains to be done, but for now we're rejoicing that we have come so far before the winter months. Looking at the hand-carved entrance, the window embellishments on the second story against the backdrop of the Himalayas, and knowing how much this means to the Anis (nuns) and the Sherpa culture, we remain immensely grateful to all our supporters. Here you can see more clearly the work on the front entrance to the residence, as well as the architectural detail on the window trim. The tent behind the building is used as a carpentry shop, where the carving takes place. In many ways this project is a labor of love for all involved. As the weather turns colder, it's more important than ever to redouble our efforts to finish up the exterior and begin work on the inside of the building, so that the nuns will have a warm, safe environment in which to spend the winter. The construction team continues to make exciting progress on the new residence building. The exterior walls are now up, the roof is on, and as you can see from the images below, the front entrance has been framed and details are being applied. As with the rest of the work at Deboche, everything is still being done by hand. The wooden entrance to the building, which reflects the traditional architecture of the region, was carved by the carpenters on site. The front steps, like all the blocks from which the building is constructed, were also cut by hand on site. We are delighted to be able to share the latest photos showing progress on the new nuns' residence. As you can see below, the first story exterior blocks are now in place, and the second story teaching/meditation space is beginning to take shape. Workers continue their labor by hand, cutting stone, laying blocks, framing windows and doors. interior framing is also in place. All work is being done under the watchful eye of Mingma Tenzin, who shared these photos. Anis relax in front of the new building. Sleeping area. The nuns are currently sleeping on the floor… next steps will be to provide furnishings for them. Watching the construction process from afar has been very exciting, but there have been many days and weeks that can only be described as nailbiters. The window of opportunity for erecting this structure was never very big...just a few short months of good weather for transporting materials, laying foundations, pouring concrete and setting stone. So much has been done in such a short time by the dedicated Sherpa workmen. Front of the new residence hall showing real progress made in September. View from the rear. The roofing trusses are in place over the section of the building that will house the nuns. Deboche is buzzing with activity under the watchful eye of Project Coordinator Migma Tenzin Sherpa. Thirty workers are on site. The foundation for the new residence has been laid, door and window framing is being put into place, and the courses of stone for the walls are being laid. Work is being done carefully, but as quickly as possible, so that the nuns will have a habitable residence before the onset of winter. Beams are in place for the second story. A worker poses with framing for an upper story window. A welcome tea break on a cool autumn day. As we await the next stream of photos from Mingma, we ask again for your help in finishing the project. We don't want to let the workers go before everything is done. We've come so far...from the first efforts to bring the nuns clean water, provide a rudimentary kitchen and some insulation in the sleeping quarters...to teaming with Architects Without Borders to design the new building...to facing the aftermath of the 2015 earthquakes...to finally seeing our dreams become reality. Please visit our You Can Help page and donate to help us reach the finish line! 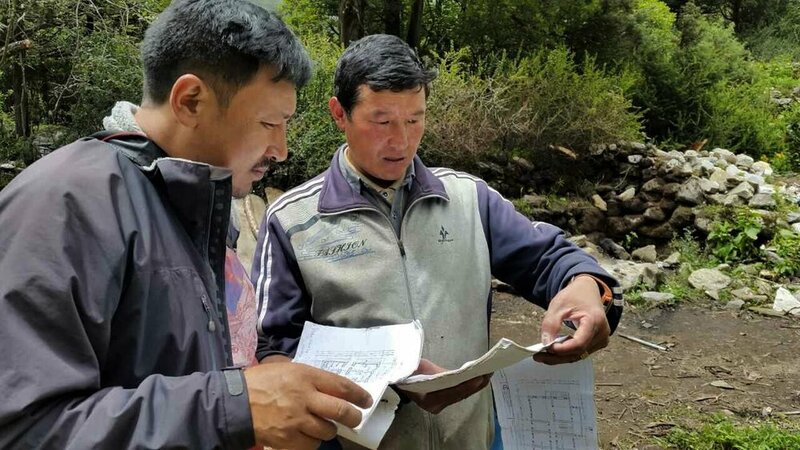 Mingma Tenzin, Project Coordinator, and Dorme, general contractor, go over construction plans. Harvesting sand for concrete on slopes prone to landslides. A worker forges metal stakes over a wood fire. Stonecutters shape foundation blocks. Each can produce about three blocks a day. We are extremely excited to announce that construction has finally begun on the new nuns’ residence at Deboche. It has, indeed, been a long and tenuous journey... through challenging fundraising efforts, navigating the process of attaining non-profit status in both the US and Nepal, facing the devastating damage done by earthquakes, and coordinating the efforts of teams half a world away from each other. Mingma Tenzin, our Project coordinator, has been sending the photos you see here of workers shaping stone, carpenters hand hewing timbers, the foundation being dug out by hand, and the cement being poured. Our dream is finally becoming a reality. This reality is, in great measure, due to the incredible efforts of MIngma Tenzin and of Laura Rose and her design team at Architects Without Borders who have continually updated the designs and engineering plans required to meet the ever-changing and challenging demands of the harsh environment of the Everest region. Click here to view the latest updates to the construction drawings. Work is complicated by the challenging weather. The carpentry shop is under cover. Construction materials are stored as they arrive on site. It may be difficult for some to imagine tackling a sizeable construction project when modern technology is not available. The new residence hall is being built with no power tools and without a single construction vehicle or earth moving machine. In the Khumbu region of Nepal where Deboche is located there are no roads, so the building site is inaccessible to heavy equipment. Transport of building materials is a fragile, choreographed effort in a season during which days are most often filled with fog and rain from the summer monsoon. Helicopters loaded with building supplies fly low beneath the clouds, which gives the pilots limited visibility before landing on a small airstrip above the Sherpa capital of Namache. From there every tool and all materials must be carried on the backs of porters through the challenging Himalayan ascents on treacherous, slippery terrain to their final destination at Deboche. Foundation wall in place with rebar. 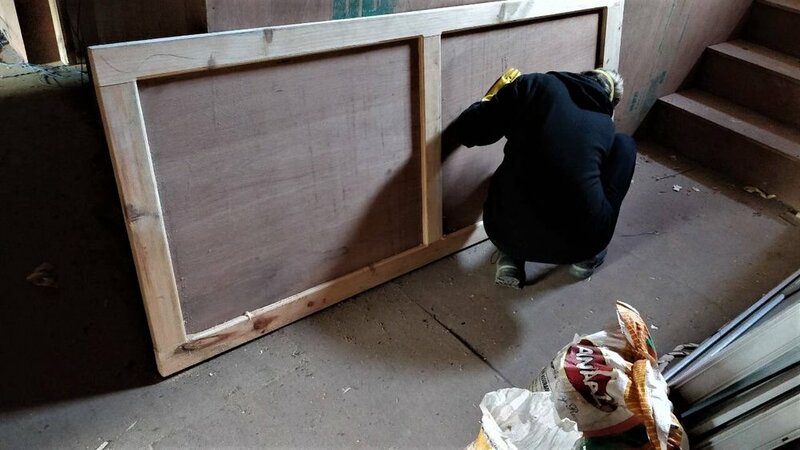 Upon arrival the lumber, bags of cement, tools, and steel and iron reinforcing bars must be secured under tarps for protection against the storms that continuously plague the high Himalaya. Shelters for the workers, dining tents and work spaces must be constructed. Just imagine 400 bags of cement being carried up thousands of feet of altitude on someone’s back, wrestling boulders weighing many tons by human power alone, harvesting bags of sand in dangerous landslide areas, and stone blocks having being hauled on back-boards to stone cutters who will shape three stones a day sitting under the dubious protection of a tarp strung between two trees. This is construction Himalayan style! It is almost incomprehensible to our western minds that this monumental effort by a workforce of over 50 men will produce a building within 3 to 4 months. But when completed, this building with its eco-conscious design and the adaptation of seismic construction techniques will provide a safe, warm and protective shelter, a new kitchen and dining room, modern sanitary facilities and beautiful spaces for study and practice for both the resident nuns and those visiting from other convents. It will also provide a place to gather and celebrate Tibetan/Sherpa culture and Buddhist traditions for the people living within the Everest region. And most importantly, it will renew, revitalize and celebrate a special place realized long ago as one of the most sacred places in the Nepal Himalaya. The head monk representing the Abbott at the Tengboche monastery presides over the dedication ceremony. With the help of private donors, corporate funding and support from Architects Without Borders, Dan Mazur and SummitClimb, Altruistic Odyssey and a most generous grant from the Pema Chodron Foundation, we have been able to fund the construction of the new building at Deboche. As we celebrate this new beginning for Deboche, we are still in need of funds to finish the interior spaces of the convent. Please consider making a contribution to help us with the completion of this important work. On behalf of the Board of Directors, our Sherpa friends in the Khumbu, the village of Deboche and its surrounding neighbors and, most importantly, the Anis of the Deboche Convent, we are grateful for your kind consideration of this request.